Amethyst Arsenic, an online poetry and art journal based out of Somerville, MA, was founded by Samantha Milowsky in 2011 to publish the best poetry and art to the widest possible audience. The journal is open to all forms of poetry from new and established voices. The journal pays for accepted work and nominates poems for established critical awards. 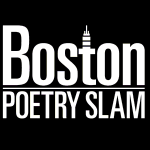 The journal has sponsored NPS 2011 and Mass LEAP, and was selected as one of 5 Awesome New Literary Journals for 2011. 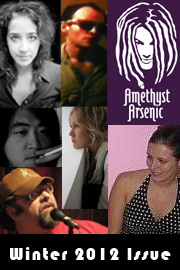 The Amethyst Arsenic Winter 2012 issue release will feature Tony Brown, Sam Cha, Karen Locascio, Michael Lynch, Gordon Marshall, Jacqueline Morrill, Alexander Nemser, Tara Skurtu, and Jade Sylvan. Doors for the show open at 7:15. The open mic begins at 8:00 and the feature performs at approximately 10:00. 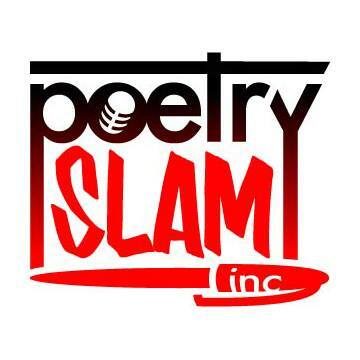 A season final poetry slam in the 8×8 series will follow. The show is 18+ (ID required) and the cover charge is $3. Tony Brown has been writing and publishing for close to forty years. Also a veteran of slam and performance poetry, including in the last few years a poetry and music duo with bass player/guitarist extraordinaire Steven Lanning-Cafaro named “The Duende Project.” Blog with link to tracks and a running stream of poetry is at http://radioactiveart.wordpress.com. Tony lives in Worcester, MA. Sam Cha lives in Cambridge with his partner, Dawn, a racket (or a mess? both collective nouns are apposite) of children, a gaggle of books, and a cat who steals strawberries. He’s an MFA candidate (poetry) at UMass Boston. Stuff by him’s appeared here and there, but that’s neither here nor there. He usually gets carded for liquor, and sometimes for smokes. Karen Locascio currently lives in Dorchester, MA. She’s attended Bread Loaf and Tin House and left the illustrious world of finance to pursue an MFA in Poetry at the University of Massachusetts, Boston. Karen loves Boston but will always be a Jersey Girl at heart. Find her on Facebook, because she could really use more friends. Michael Lynch lives and writes in Melrose, Mass. His poetry has appeared in Night Train, In Posse Review, White Whale Review, Harvard Divinity Bulletin and elsewhere. A chapbook, Underlife and Portico, is available through Aforementioned Productions. Versed in critical theory and versatile, Gordon Marshall writes jazz criticism in addition to the eleven volumes of poetry he has published (Shires Press). Jazz Journalists Association president Howard Mandel writes of his work in this field: “The images are many, word choices artful, concretization of abstract or elusive points well-realized.” A corresponding sensibility characterizes his poetry. Jacqueline Morrill fell in love at first slash. A graduate student at Sarah Lawrence College, she devotes her thesis writing to tales of sexual fetishism, pseudo-psychology and the feeding habits of forest animals. Blurring the line between persona and personal, she delivers the last words of murdered children off a silver tongue that no sooner begs forgiveness than it asks acceptance. 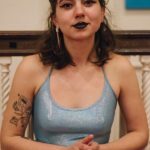 Hailing from Worcester, Massachusetts, Jacqueline has become a strong and welcomed voice in the Worcester poetry scene over the past few years. She looks forward to graduating and plans to teach creative writing at the collegiate level, back in New England. Alexander Nemser’s poetry has been published in The New York Times, The Atlantic Monthly, and The Paris Review. He has performed his work internationally, including at the Bowery Poetry Club and the Galle Literary Festival, Sri Lanka. Tara Skurtu studied Creative Writing at the University of Massachusetts, Boston. Her work has twice been recognized by the Academy of American Poets: she received the 2010 Academy Harold F. Taylor Prize (judged by Jericho Brown), and won an Honorable Mention for the Academy’s 2008 Prize (judged by Elizabeth Alexander). Lloyd Schwartz selected her as the recipient of the 2010 Marcia Keach Poetry Prize. 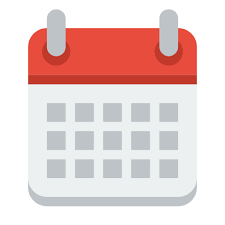 Tara’s work appears or is forthcoming in: Poet Lore, Salamander, Hiram Poetry Review, The Southeast Review, The Comstock Review, and in the anthology Viva La Difference; Poetry Inspired by the Painting of Peter Saul. Jade Sylvan is a nationally-touring poet, songwriter, speaker, and teacher. Her first full-length collection of poetry, The Spark Singer, was published in 2009 by NYC’s Spuyten Duyvil Press, and her work has appeared in Word Riot, Decomp, The Pedestal, The November 3rd Club, and OVS. She is the co-founder of Mass LEAP (Massachusetts Literary Education And Performance), a collective that creates teen poetry opportunities in greater Boston. For the past couple of years, her OCD has been hijacked by the Rock ‘n’ Roll icons of the 1960s and their mythological resonances. She currently works as a writing teacher and teen mentor in Somerville, MA. Her hip-hop side personality, Madame Psychosis, has a Zombie Apocalypse music video online, and she released her first album of original indie-folk music, Blood & Sand (Red Car Records) in 2011. She does a lot of other things.